There was a “throw down” at Bulldog Stadium Friday night, and it wasn’t only on the football field. The Diamondback cheerleaders were vigorously rallying to be the loudest squad against the Virgin Valley Junior Varsity cheer team. The girls pepped up our crowd with some new cheers that helped lead our Diamondbacks to victory. The girls have a great time off-ranch at football games because “it’s like being at a real high school”, says Becky. 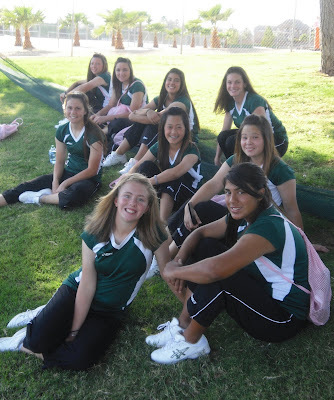 Participating in cheer is a rewarding creative outlet for many girls at Diamond Ranch. 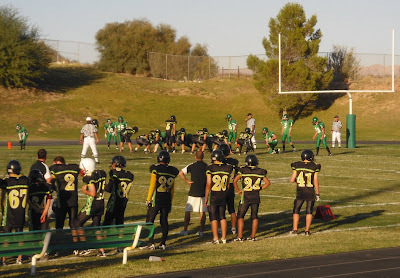 So if you ever get the chance, go to a Diamond Ranch Academy game. 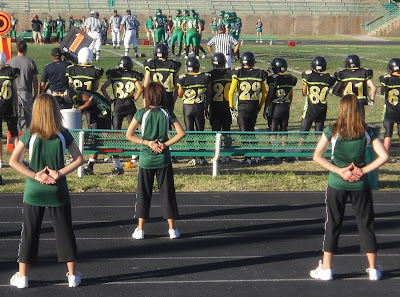 Cheer for our girls’ hard work, and also for another victorious effort from the fearless Diamondback football team. Go Diamondbacks!